I have often written about how I have found meaning in the Jewish books I read to my kids when they were small. We specifically looked for books that had a lesson about important Middot (character traits) or holiday customs. An added bonus was that the lessons that we were trying to teach our kids were reinforced to usthrough the books as well. When Rosh Chodesh Elul‎1came around and we began to blow the shofar at the end of davening every morning, I was reminded of my all-time favorite Rosh Hashanah book “Showfy and Blowfy” by Malka Danzinger. Even though my girls are already “big” I still pulled out this book this week and read it to them while they were getting ready for school one morning. 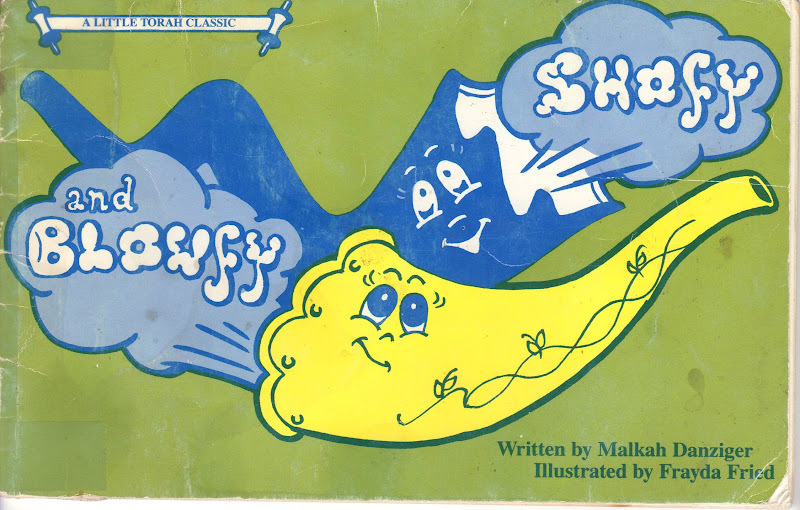 Without spoiling the whole plot of the book, Showfy and Blowfy are two shofars that are blown on Rosh Hashanah. When one is blown, the congregation not only hears the shofar sounds, but they also hear “Hashem‎2is King, Hashem is King, Hashem is King over heaven and earth.” When the second shofar is blown the next day the congregation not only hears those shofar sounds, but also hears “Time to do Teshuvah‎3, Time to do Teshuvah, Time to do Teshuvah, time to say I’m sorry and I’ll be good.” How powerful is that? I actually now think those things when I hear the shofar sounds. Those are the real messages of the shofar. Although we are thinking about all the things we need to do, and all the food we need to prepare for Rosh Hashanah, this simple children’s book helps us to think about the true meaning of the holiday. We love Showfy & Blowfy!! But “real life” happens and we do need to think about the preparations, and guests (all 50 gajillion of them), and all the things that “real life” encompasses. Did you ever reach the point when you just can’t do one more thing? Not one more thing!!! You are on complete overload and putting one more thing on your plate will just push you over the edge? Right over the edge. Juggling somany things that you’re afraid that one of the balls you have flying in the air will come crashing down and hit you in the head???!!! Yup. That’s me. Passed that point a while ago. That’s when survival modekicks in. Ok kids, you want chips, cupcakes and Pirate Booty for lunch…no problem – can you please just add a fruit to it so I don’t get called from the school? Oh, and we need to replace our toaster oven that shorted out so the kids can have frozen pizza slices for dinner (BTW – we did pay 53¢ for the new toaster oven…I may be overloaded but I’m still a greatshopper!). Things are always a little crazy around here, but we’ve just reached a whole new level of insanity!!! When we left my mom (KIH‎4) in the hospital last night at 3:30 AM after an emergency trip, we were amazed that things have actually got more challenging! We weren’t sure that was even possible…but it was! My consolation is that hopefully this wild roller coaster ride is temporary, and that life will revert to “normal” crazy at some point. So, when life gets really crazy you call for backup right? Hopefully, I help you a little when yourlife is crazy with the recipes and fun anecdotes…but for now I’m calling for backup. HELP!! In the world of a food writer, freelance pastry chef and super busy Mom/Daughter, backup comes in the form of a really great baking cookbook. One of the huge perks of being a food writer is that I have the privilege of getting advance copies of the latest and greatest kosher cookbooks to review. 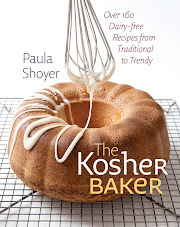 Last week I got an awesome one, “The Kosher Baker” by Paula Shoyer. Thanks Paula!! She really is a baking expert, and the book tells us about her interesting background and experiences. It’s packed with great baking recipes, from the simplest one-bowl variety to those for the more ambitious. Fabulous cookie, biscotti & bar cookies – all in one bowl! There are great pictures that show how to make more complicated recipes step by step. Even the more complex recipes are presented in a way that makes them approachable. It’s my life preserver – right in the beginning of the book were three recipes I immediately wanted to make this week (and I didn’t have to come up with them myself either- whew)!! How great is that?! Reviewing the rest of the book didn’t disappoint either. I wanted to make nearly every recipe – and as a freelance pastry chef that’s a big deal! Many of the recipes have instruction about preparing in advance and freezing (like the fabulous Chocolate Peanut Butter Mousse Cakes – YUM! ), which is incredibly helpful especially when cooking for Yom Tov. You can actually make the dessert in advance. Now, last Shabbat, with 20 minutes before I had to go upstairs, shower and get ready for Shabbat , I grabbed “The Kosher Baker” and whipped up two of the three “one bowl” recipes I had planned to make. I made the Honey Cake with Pecan Swirls and the Apple Upside-Down Cakein no time at all. 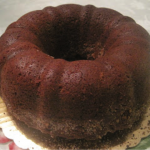 In my rush I didn’t realize that the Honey cake was supposed to go into a loaf pan (it’s got a gorgeous crumb topping) and did it in a bundt pan instead – but you know what? It came out great!! And pretty too!! The crumbs created a pretty decorative border layer on the bottom of the cake (phew!). I followed the directions for the Apple Upside-Down Cake and layered the apples in three rows as specified. I think I needed to make the apples a little thicker though, sadly most of them got lost in the batter, but the cake was impressive anyway. The Honey and Apple cakes are perfect for Rosh Hashanah dessert – I’m freezing both the cakes and will be serving them to my Rosh Hashanah guests. I’m sure the cakes will get rave reviews. It was all I could do the keep the ravenous hoard from digging into them. I’m saving the powdered sugar toppings for when I serve them on Rosh Hashanah. And now I have to get back to life….Time to do Teshuvah…. 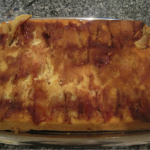 Here are some more of my Rosh Hashanah recipes/articles. Have a Happy & Healthy New Year!! Rosh Chodesh Elul: The beginning of the Hebrew month of Elul, the month before Rosh Hashanah. KIH: Kein Iyna Hara – Yiddish for without an evil eye. You can find “The Kosher Baker” on Amazon.com. Grease and flour a 12-inch loaf pan. Place the pecan halves in a bag and crush them with a rolling pin until the largest pieces are between ¼ and ½-inch long. Add the ½ cup sugar and 1 tablespoon cinnamon to the bag and shake to combine. In a large bowl, whisk together the coffee and honey. Add the oil, 1/3 cup of the white sugar, the brown sugar, and eggs and whisk well. Add the flour, cloves, cinnamon, ginger, baking powder, and baking soda and beat with a stand or hand-help electric mixer on medium speed for 2 minutes, or mix vigorously by hand until you have smooth batter. Scoop up 1 cup of the batter and pour into the pan. Tilt the pan in a circle so the batter covers the entire bottom. Sprinkle on 1/3 cup of the nut mixture, covering the entire batter. Repeat with another cup of batter and 1/3 cup of the nut mixture. Pour the remaining batter on top and spread gently to cover the nuts. Let cool for 10 minutes in the pan and then turn out onto a rack to continue cooling. This cake is good either warm or at room temperature. Grease a 9x13-inch pan with spray oil. In a small bowl, mix the cinnamon with 3 tablespoons of the sugar. Sprinkle on the bottom of the prepared pan. In a large bowl, beat the flour, remaining 2 cups of sugar, eggs, oil, and vanilla with a stand or hand-held electric mixer on medium-high speed or by hand until well mixed. Peel and core the apples, halve them and cut into ¼-inch-thick slices. Place the slices on top of the cinnamon and sugar in the pan in 3 long rows of overlapping slices. Pour the batter over the apples and spread evenly. Bake for 1 hour, or until the top is browned and a skewer inserted comes out clean. Let cool for 30 minutes and then turn over onto a large serving platter or tray. Just before serving, sift the confectioners’ sugar over the top. The sugar will seep into the apples and heighten the taste. Store covered in plastic at room temperature for up to four days or freeze wrapped in plastic for up to three months. Line a jelly roll pan or large cookie sheet with parchment. In a large bowl, mix together the flour, sugar, baking powder salt, orange juice, eggs, oil, and vanilla until it forms a dough. Add the chocolate chips and mix again to evenly distribute the chips. Divide the dough in half and shape each half into a log about 10 to 12 inches long by 3 to 5 inches wide. Place the 2 loaves on the prepared pan, about 5 inches apart. Place in an airtight container or freezer bags and store at room temperature for up to five days or freeze up to three months.